Unfortunately, it is politically incorrect to address the issue of expanding wild population of traditional prey species. As we cannot rightly tolerate a return of the predator prey cycle as we ourselves would soon become prey and the cycle itself is horribly inefficient with huge swings of boom and bust, it will become necessary to apply real husbandry. In the case of the wild horse, that means an annual drive to corral a portion of the herds while applying selection and disease treatment protocols. This provides an annual source of horse protein that may be handled in a number of ways. Once fattened a portion could even enter the long established human food chain. The rest can be used as a protein source for managed stocks of carnivores. World wide there are huge potential prey species populations that simply need to be successfully managed without the encouragement of an excessive carnivore population. A lot of that meat protein will quite rightly flow into the human food chain but plenty will not. Populations of carnivores provide the natural scavengers of this surplus. Technology may soon allow us to interact more successfully with all creatures and thus alleviate the management issue. With appropriate technology, the lion can lay down with the lamb. In that case, they have both a role in scavenging and a role in herd management as in outright protection and shepherding. Carol Walker, who lives outside Longmont, Colo., adopted three wild horses, from the Bureau of Land Management for $125 each. For many, this would be their first human contact, beyond the workers who feed them at this 80-acre holding center, 100 miles southwest of Denver. Long a totem of the American frontier, the tens of thousands of wild horses who roam across forgotten stretches of the rural West are at the heart of an increasingly tense dispute over their fate. The bureau says their numbers continue to grow at an unmanageable rate, despite years of removing wild horses from the range to enclosed pastures so that wildlife and livestock can share the land. Horse advocates contend that the government’s approach has not only failed, but is also needlessly cruel. And they say the horses should be able live out their lives freely. Despite deep differences on how the animals should be managed, both sides agree on one thing: The situation has reached a tipping point. These days, the temporary holding pens and long-term pastures where many wild horses end up are nearing capacity or full. And the cost of caring for them has ballooned over the past decade. The question of what to do with the animals — descendants of United States Cavalry horses, workhorses and horses brought here by Spanish settlers — has confounded the federal government for decades. In an effort to maintain a stable population, while also preserving public land, Congress passed the Wild Free-Roaming Horses and Burros Act of 1971, allowing the bureau to remove “excess” wild horses from the range. But with virtually no natural predators, herds typically double every four years. Currently, about 37,300 wild horses and burros roam across federal rangeland in 10 Western states, about 11,000 more than what the bureau deems manageable. Each year, the bureau conducts roundups to thin the population. Low-flying helicopters drive the animals into traps before they are taken to holding pens and permanent pastures. The roundups have long been criticized as inhumane and dangerous. Photos taken by advocates of a recent roundup in northern Nevada appear to show several confused horses stumbling into a barbed wire fence. Another shows a wrangler with a foal slung across his saddle. Advocates said the animal collapsed after being stampeded for miles. While acknowledging that a small number of horses get hurt or die during the roundups, the bureau defends the approach as the only option given the circumstances. Mr. Gorey said that the agency does everything it can to minimize injuries. But the bureau concedes that gathering more horses is not a panacea. Nearly 50,000 wild horses and burros are already housed at temporary holding pens or pastures, more than triple the number from a decade ago. “People need to realize that we’ve done more than what was envisioned under the Wild Horses Act, which is why we’re in the situation we are today,” said Mr. Ackley, the head of the bureau’s Colorado program. He noted that horses at the Cañon City facility are well cared for, whereas drought and wintry conditions can make life on the range especially harsh. A prison inmate training program at the center will also ready some of the mustangs for adoption. But advocates say that the trauma of being separated from their families and the range leaves the horses dispirited and stressed. 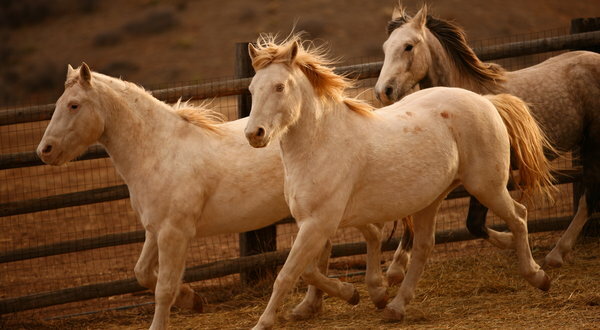 This month, a strange illness sickened horses at Cañon City, and 19 died or were euthanized. Mr. Ackley said he had never seen anything like it. Arguments about whether the holding pens or long-term pastures are acceptable homes may be moot. With a steep decline in adoptions, and waning interest from buyers — because of the soaring price of hay — there is little room to care for any more. Driven largely by what it costs to hold the animals, the program’s budget has risen to $75 million this year from about $20.4 million in 2000. Mr. Salazar said some progress had been made in finding a solution, noting that the bureau was using fertility-control drugs on mares, which advocacy groups favor, and looking into developing sanctuaries where more horses can live. In recent months, though, horse advocates have ratcheted up criticism of Mr. Salazar and the bureau, after the news organization ProPublica reported that the bureau had sold 1,777 wild horses to a Colorado livestock hauler, Tom Davis, a proponent of horse slaughtering. The Interior Department’s inspector general is investigating whether Mr. Davis sold the horses over the Mexican border for slaughter. The United States’ last horse slaughterhouse closed in 2007, and buyers must agree not to sell wild horses to be killed. Mr. Salazar said several safeguards were recently put in place to ensure wild horses are kept safe after sale. In the meantime, horse advocates like Carol Walker view the bureau’s long-term strategy as untenable. On a recent morning, Ms. Walker watched as three mustangs meandered around her rolling property near Denver. Ms. Walker adopted the wild horses from the bureau for $125 each, the going rate, and had them trained. Her youngest horse, Mica, comes from a Wyoming herd that is the focus of a legal battle between a local grazing association, which wants the herd removed to protect livestock forage, and horse advocates. Ms. Walker ruffled Mica’s mane as he nuzzled his nose against her neck. The same problem exists with elephants in South Africa, and using contraception on the females has lead to unnatural behavour in the bulls. This broke the family structure up and was judged not to be a solution. After trialling that for over a decade they have returned to culling the herds, mimicking the system that would exist in a balance of predator and prey.. Nature is cruel but also what everything has adapted to. Thus imitation both works and is stable. It does beg the question of our own experiments in recent human history. I am loath to go there but imitation of the human natural cycle needs to be thought out and even experimented with. That needs to also coincide with child birth imitation and artificial final gestation i suspect. We are not there.